Leeya was center stage in her boudoir session and these portraits are all about her, for her. 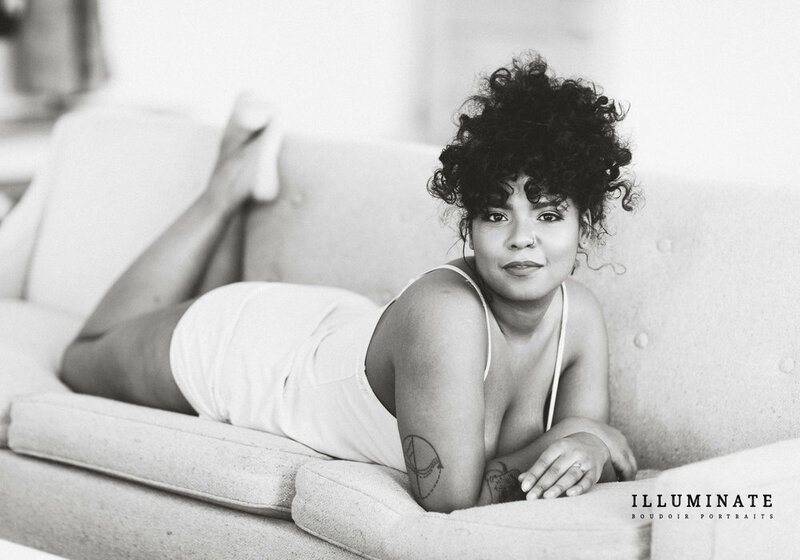 As an artist, model, and creative working in advertising, this was a unique experience for Leeya. She is often behind the scenes bringing photoshoots to life or modeling for a specific purpose. Leeya still had a hand in shaping how her portraits would look and feel, but she was free from appeasing anyone else’s goals or selling products. This was all about her, and I love the power and self-love that comes through in her energy. Leeya wanted this experience to be an opportunity to explore her vulnerable feminine side and her pictures to feel ethereal, airy, and soft. She had thought about doing boudoir for a while prior to her session, in part inspired by a stunning picture of her grandmother, who modeled in the 1950s. One of the inspirations behind Leeya’s session: this portrait of her grandmother. On her photoshoot day, Leeya showed me the portrait of her grandmother: she looks breathtaking and glamorous, wearing a swimsuit and holding an umbrella. Leeya had brought along an umbrella and a bodysuit, and asked to recreate the photo as an honor to her grandmother, and I honestly I got goosebumps. I love that Leeya had these ideas in the back of her mind and we were able to create portraits that feel very special and very her. Chee of SM Hair + Makeup did Leeya’s hair and makeup and incorporated a really cool layering element in her eye shadow. When Leeya’s eyes are open, they look light and bright. When she is looking down, more drama and color on her eyelids is exposed. Leeya’s look felt very natural and dramatic at the same time and I liked the way Chee intentionally played off the colors in her boudoir wardrobe. Leeya brought a pile of outfits and pieces along the morning of her session and together we refined her final wardrobe choices for her photoshoot. I often work with clients to talk through what they are most excited about wearing and what will fit together well. Leeya’s final wardrobe has a really beautiful mix of colors and textures - some things that feel light and soft and feminine, some things that feel more relaxed and casual, and some pieces that feel more classic and bold. Leeya had this amazing bodysuit that she wore for several of her portraits. It was black with really beautiful lines going through the fabric and some geometric ruching at the top. It was super elegant and unique, the neckline could almost be the top of a formal gown. She also brought a skirt that was perfect for twirling in. We went to a window for a series of her spinning and laughing in it. There was a ton of energy, and I ended up compositing these into a double-exposure portrait to capture all the movement and life in this moment. Leeya, thank you so much for trusting me with your portraits - and for sharing the amazing story (and portrait) of your grandma - what an inspiration. I so enjoyed being around your creative energy during this entire photoshoot day, and am so thankful that we were able to create these heirloom portraits together. Thank you for everything.